CW675 - Patriotic Design Kick Ball 2"
Patriotic USA Kickball 2". This imprinted, two tone kickball is semi soft and squeezable and features a delightful two colored kickball with a diameter of 2''. It's made from high quality polyurethane and is available in a variety of colors. Soft and squeezable, It's widely used as a stress ball. Also known as the hacky sack ball. 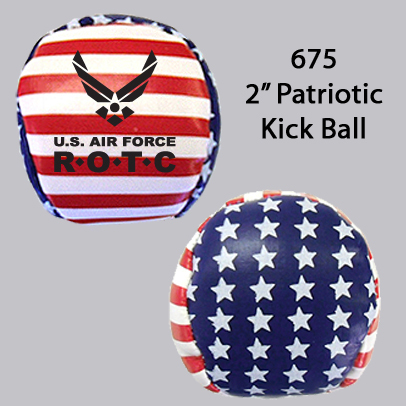 Perfect for patriotic events and election and other giveaways. Please inquire for other colors.